In 2012, COSI initiated an effort to improve the visual appeal and experience of our hallways and circulation spaces. With limited funding, we developed a combination of temporary experiences, painting, and permanent exhibit acquisitions. An effort was made to include content that would appeal to adults as well as family groups. The new experiences are planned with a nod to our permanent exhibit areas and grouped in collections as opposed to singular exhibits. From gorgeous photography to thought-provoking collections, enjoy these free, limited-engagement displays on your next visit. Michelle Stitzlein has been creating sculpture with recycled materials as a full-time artist since 2000 in her Baltimore, OH, studio. Her work has been shown in art and craft museums nationally. 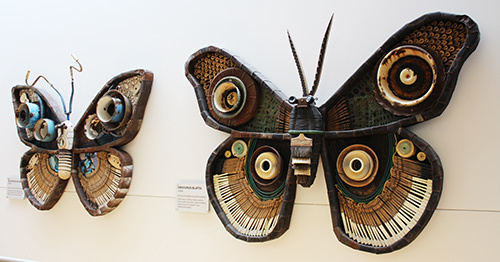 The “Moth Series,” was inspired by moths in her backyard and the premise that recycled materials have the capacity to metamorphose into larger objects of great beauty. 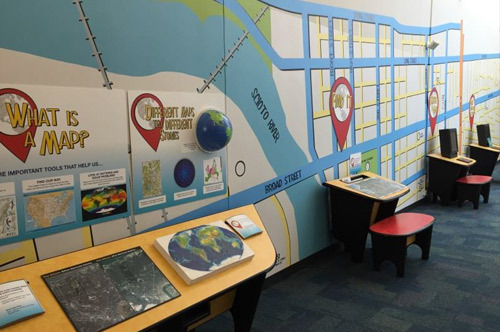 These interactive experiences engage visitors in the process of producing maps and planning adventures. Maps are tools that help people make sense of the world, make decisions and solve problems. The large wall mural on Level 2 communicates the Scioto Greenways project happening on the river including removal of the Main Street Dam, improvement of the ecological systems and river habitat, and creation of a stunning 33-acre greenway through Downtown. Additionally, 2 new interactive exhibits on Level 1 – Dirty Water Fountain and Outmuscle the Mussel – help to educate the public about river ecology. What do a bagel, a ball, and a banana all have in common? If you slice them through the center, you’ll always find a circle. Circles are everywhere. 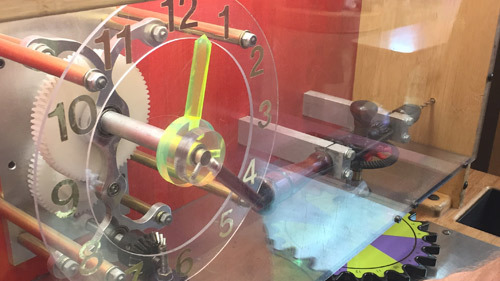 Explore how they are made, how useful they are, and where they are found all around the world.